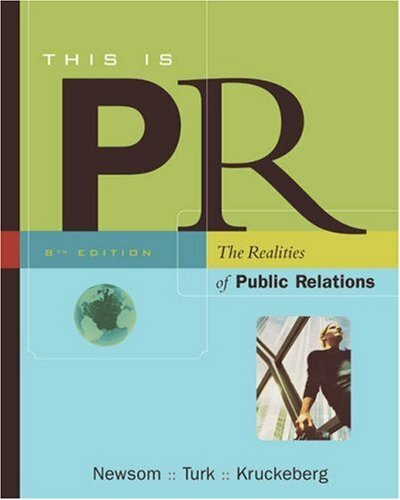 THIS IS PR: THE REALITIES OF PUBLIC RELATIONS is now available in a new paperback format providing the same great coverage at a value price for students. This authoritative text was written to provide information and guidance that will be useful to the experienced practitioner as well as to the beginning student. Students are introduced to the world of public relations through a strong emphasis on public relations fundamentals, such as history and research, as well as emerging issues, such as technology, ethics, and the international aspects of public relations. With numerous examples, strategies, tactics and case studies, students are sure to engaged and prepared! Part I: PUBLIC RELATIONS: ROLE, ORIGINS AND TRENDS AFFECTING THE FUTURE. 1. PR Roles and Specialties. 2. PR's Origins and Evolution. 3. Trends in PR. Part II: PR RESEARCH. 4. Research: Planning Processes and Techniques. 5. Publics and Public Opinion. Part III: THEORY, ETHICS AND LAWS AFFECTING PR PRACTICE. 6. Theoretical Underpinnings for PR. 7. PR Ethics and Responsibilities. 8. PR and the Law. Part IV: PR IN ACTION. 9. Strategic management in PR Practice. 10. Communication, Channels and Media. 11. Tactics and Techniques: Details that make PR Strategies Work. 12. Campaigns. 13. Crisis and Credibility. 14. Public Relations Practice and a World View.